Starring: Robert Vaughn, Frank DeKova, Leslie Bradley, Darah Marshall, June Jocelyn, Charles P. Thompson, Jonathan Haze, and Beach Dickerson. More than any other philosophy, I find wabi-sabi, the Japanese philosophy celebrating the inherent beauty of imperfection, to be the philosophy which most naturally applies to the world of bad movies. If you are reading this, I imagine you don’t need an explanation about the joys of bad movies. 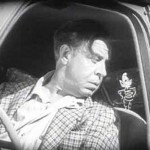 The joy of experiencing a line of Ed Wood dialog for the first time. The delight of a well done, but obviously cheap, special effect. The absolute bliss of watching the late David Carradine in anything. Most bad movies possess some amount of cinematic wabi-sabi, but nobody’s films—with the possible exception of the aforementioned Ed Wood—embody the spirit of wabi-sabi better than Roger Corman. Corman is, of course, famous for the countless, tightly-budgeted, and quite profitable quickies he churned out during (and well beyond) the heyday of drive-in theaters. 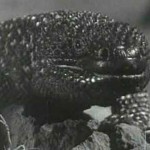 Sparse sets, reused footage, and frugal special effects were the hallmark of Corman’s style. 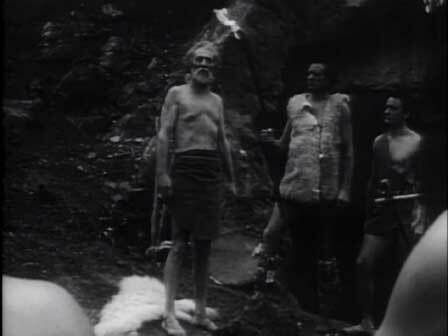 A perfect example of this style, and incidentally one of my favorite Corman movies, is 1958’s Teenage Caveman. Sure he invented the pan flute, but what about pants? 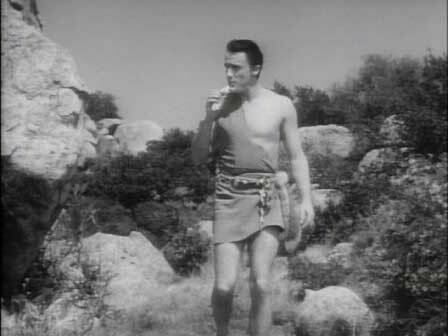 Starring the very “Shatner-esque” Robert Vaughn as the titular (and not very “teenage”) caveman, Teenage Caveman tells the tale of a young man who wonders about his tribe’s old laws and traditions. Because of these laws he and his clan are confined to living and hunting in a desolate, barren wasteland, while only a few feet away, beyond the forbidden river, lush greenery and creatures of all kinds are there for the taking. He constantly questions his clan’s elders about the truths behind the laws. You know how teenagers are. Shoplifting from the petting zoo. Opposing our rebellious hero is The Black-Bearded One, played by Frank DeKova. His ultra-conservative character wants to uphold the old ways at all costs. Of course in the typical subtle-as-a-sledgehammer, Roger Corman approach, conservative equals screaming “Evil!” and “Kill!” every 10 seconds. Eventually you will want to jump inside your television and beat him senseless with a bit of wood. DeKova’s character, that is–not Roger Corman. Although at times you may wish to visit horrible, stick-related violence upon him as well. In retrospect, following the Ric Flair workout method was an obvious mistake. These two characters bump heads until the young caveman, ignoring the wishes of his beautiful mate (played by the jaw-dropping Darah Marshall), decides to cross the forbidden river and kill the supposed god that, along with the clan’s unquestioning adherence to tradition, prevents his people from cultivating the fertile land beyond the river. 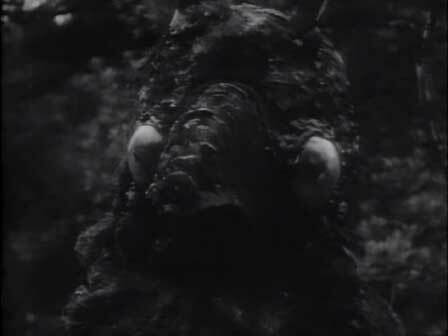 Corman fans (Yes, we do exist) will no doubt recognize the “God” as the less-than-menacing alien invader from Corman’s earlier production, Night of the Blood Beast. Teenage Caveman has a surprise ending which I won’t spoil here, but I will say it immediately puts one in the mind of Planet of the Apes. Perhaps it even served as inspiration for Rod Serling when he wrote Planet of the Ape’s classic ending, but I tend to doubt it. It may seem a little heavy-handed and hackneyed when I watch it now, but I remember it having a profound effect on me as a little kid, even watching it for the first time as I did through the constant stream of ridicule that was Mystery Science Theater 3000. Of course, I was only eight years old, so it wasn’t exactly hard to blow my mind. I can't imagine what could possibly be offscreen that would distract me from those, uhh, I mean from her. The film’s underlying message of questioning taboos, mystic dogma, and even the collective consensus of those around you in order to better your own life is unquestionably its most redeeming quality, and is certainly in line with my own philosophy, as well. Although, one of Corman’s previous films, It Conquered the World, espouses the nonsensical belief that man is a superior being because of his emotions, rather than because of his superior mind. As anyone who has tried reasoning with a person who is completely at the mercy of their emotions will tell you, this is complete nonsense. What I’m saying is that while I may agree with the majority of this particular film’s message, it’s probably best not to attempt to construct a makeshift philosophy from the films of Roger Corman. No silly caption, I just wanted another screenshot of Darah Marshall. 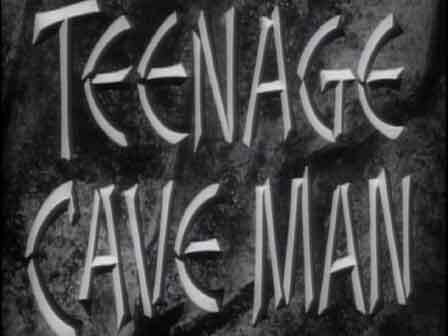 When it is all said and done, Teenage Caveman is little more than your typical Roger Corman quickie, albeit with a touch more substance than usual. Like a midget stripper or a mime with Tourette syndrome; it is entertaining, but irreparably flawed. Now if you’ll excuse me, I have to begin writing letters of apology to The Little Persons Pole Dancers Association of America and L’école Internationale de Mimodrame Involontairement Vulgaire. 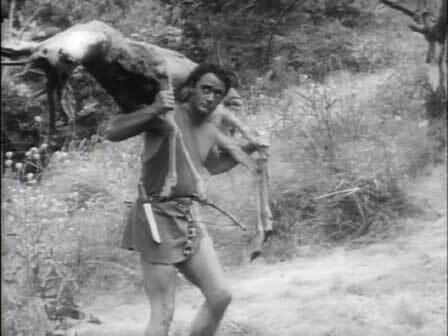 Watch our young caveman hero as he encounters stock footage, kills an annoying squirrel, invents fire, and finally meets up with a really goofy Roger Corman monster. Check out his George of the Jungle impersonation at the end. Ouch!